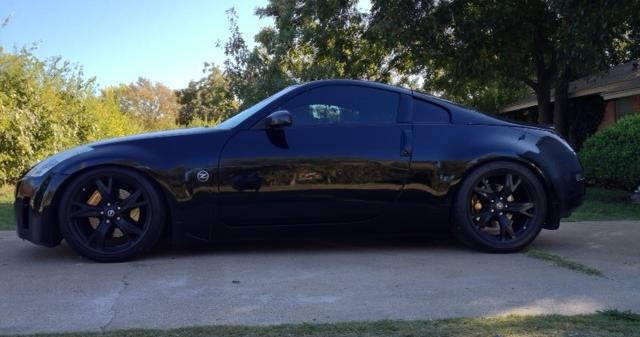 so i bought my 06 350z in the fall and now its time to put it on the road. the problem is the rear offset isnt really right and they stick out to far/rub fender everywhere. Rears are the xxr 20x11 526, ET 13 all-round, Tires are 285/30/20. iv been researching coilover options but i need some help deciding and maybe some of you guys running aggressive rear set ups and shoot me in the right direction. im not looking for very high end, dont plan on racing or drifting the car, just wanna mainly fix my problem..keep a clean looking stance, and dont mind the added performance & adjustability you get with coilovers. what rear rates do you guys recommend? True coilover vs OEM rear style? kits with camber adjustment? can this be adjusted at stock? or do i need to get some aftermarket camber componets? I wish this had been posted yesterday. 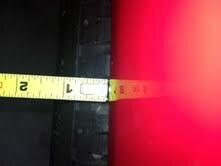 I ordered some 285/35/19's for my 11" rear wheels and I dont really want to have to deal with this. For the to tuck inside the fender it looks like you would need some serious negative camber. Then you run into the problem of tire wear...oh boy. Just roll the fender, you will clear no problem. No extra camber is needed. to gain a stiffer suspension so the car doesnt sink so far? Last edited by drabes350; 04-09-2013 at 12:48 PM. you can buy a stiffer spring! As the suspension compresses , you gain camber. Read about it, we have a lot of camber gain do to the unequal length control arms. Springs do not keep you from rubbing, they just make things stiffer. With your suspension set up on stiffer springs you should still have the same amount of up travel, if you rub with soft springs , you will rub wiuth stiff springs, but it will take a little harder of a hit before they touch. As Waizzz mentioned, roll the fenders, if you still rub, add a slight amount of camber till the rub goes away. 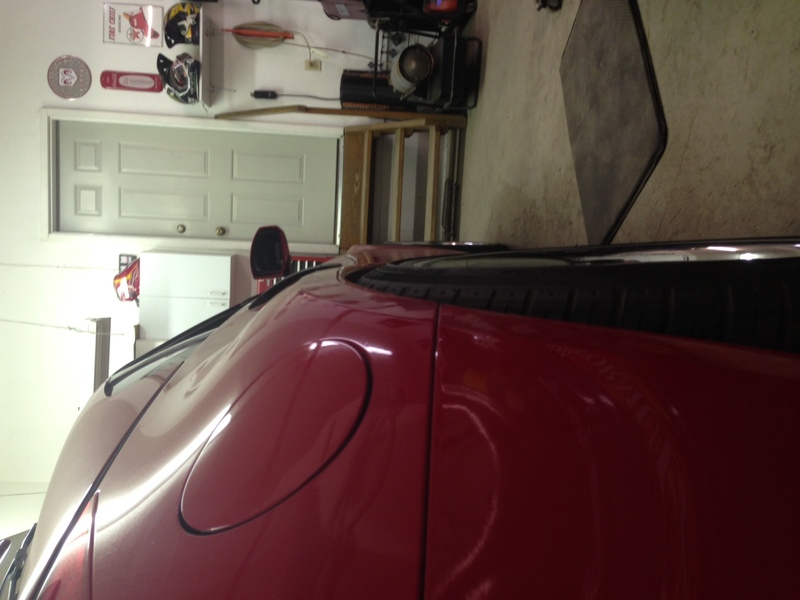 On cars that are really freaking close, i like to set the camber with the spring removed. I set it to where it will not rub. Then install the springs and bring the car up to ride height and set the toe. On bumps under heavy load I have had contact between the wheel and shock body with an 18x12 +19 w/ -2.5 of camber...2.5mm spacer solved the problem. Another option is of course... just buying wheels with the right offset, say like +25 to +30 for an 11 inch wheel! EDIT: Of course, rolling the fenders doesn't hurt, but just trying to tuck the tops of the tires into the wheel wells accomplishes little if you're way out there (looking back at your small pics again, doesn't look too bad I guess). It still looks suboptimal and you will likely end up with more negative camber than is necessary or useful. Last edited by rcdash; 04-09-2013 at 05:18 PM. so your sayin i would need alottt of camber to tuck something like that? Last edited by drabes350; 04-10-2013 at 07:48 PM. any body else have input? 285/30/20 +13 OFF...really clear with just rolled fenders?? Last edited by drabes350; 04-10-2013 at 11:32 AM. I have no issues, I didn't have to roll my fenders when I lowered mine about 2" to 2.5" in the rear running 285/35/19 on 370z sport wheels "19x10 30mm offset" and the alignment is within specs. I don't think coilovers or stiffer springs will solve your problem because I am running Stance GR+pro true coilovers that have the helper springs, and I upgraded to the Swift springs with a stiffer spring rate and it still has a decent amount of travel. I hate to say it but if I were you I would just bite the bullet and get some wheels with a different offset, you will not regret it due to you will have to roll and stretch your fenders and prob have to do some neg camber and wear out your tires. Last edited by slmdchvy05; 06-28-2013 at 07:28 PM. Looking at that, I'd assume you'd need somewhere in the -5 to -7 camber to clear that fender with no further adjustments. And, quite honestly, I'm not really sure if you have the stomach for that. A lot of people get all squirely past -3. I still think your BEST option is to just pull the fender. A roll will do you no good because the tire sticks out past the fender. You'll have to do a slight pull to make it work. But, a heat gun, a roller, and 2 hours will get'r'dun. If you're in a really tight jam, you can even use a heat gun and rubber mallet. It's a bit riskier, but if you take your time, you can achieve your desired result without getting gremlin fenders.